Sunbeams is a music therapy charity which last year celebrated 25 years of helping people with a wide range of disabilities across the north of England. Often working in sub-standard facilities, such as space in underused local authority or NHS buildings, their participation-based therapy gives users an important means of communication which otherwise may be very difficult. Service users range from young children with often severe disabilities, or behavioural and emotional problems, to people with Alzheimer’s and dementia – one of the goals of special needs teacher and Sunbeams founder Annie Mawson was to provide ‘Music for Life’. Her belief in harnessing the power of music as an inclusive healing tool is corroborated by several grant funding bodies including charity sponsor, social justice charity COINS Foundation, which said the therapy “invokes a sense of belonging to a huge variety of people.” The only missing piece of the jigsaw was a decent facility from which to operate – including the space to store and house the trust’s growing administrative functions – and this was where architect (and Annie’s nephew) Will Mawson entered the scene. While in the final year of his degree and trying to find the right topic for his thesis, he realised that his own love of music and close connection to Annie’s charity were pointing him in an obvious direction. Mawson tells ADF: “I was intrigued by music therapy – how it works, and what conditions might make it more successful.” He began researching the ideal facility to support it, using Annie’s practical expertise (she is also a harpist and singer), as well as the leading UK music therapy provider Nordoff Robbins as key sources of information: “They kindly let me have a look round their centre in London, at the time the only purpose-built centre in Europe.” With his studies having taught him that music therapy ideally required people to be “in a calm and tranquil state of mind,” he sited his ideal unit on the shore of Ullswater, the famously idyllic Cumbrian lake. This was the polar opposite of Sunbeams’ current facilities, but serendipitously, the eventual site of charity’s new home would not be far away. After graduation, Mawson began working at Newcastle practice Napper Architects. He explains how a few months later, he got an unexpected call from his aunt: “Just so you know, we had a board meeting last night, and it was unanimously approved that we are going to build a centre.” Despite her enthusiasm for applying his model in reality, he had to manage her expectations about the size of the challenge; at the time the charity were renting small office space in a country house and had never built a building before. 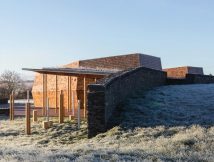 However the momentum began to build regardless, with the charity’s reputation seeing it gifted a difficult site, landlocked by the M6 near Penrith, but Mawson designed and got planning permission for a scheme. Then in another twist, a further site was gifted to the charity. This one was perfect, fairly isolated on the brow of a hill with uninterrupted views into the Ullswater valley, and a 100 year peppercorn rent. Mawson says that the iterations his model had been through were a benefit, enabling the design to be refined. “Because we’d been through these processes of knuckling down and saying ‘what was it you really want from your centre?’, this final one designed itself really quickly”. 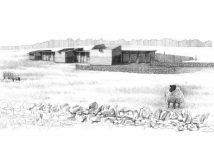 Sloping down away from the A66, the site’s geology allowed the architects to both nestle the building into the landscape and offer wonderful south-facing rural views. As Mawson says, “We wanted it to appear to have grown out of the earth, so we really embedded it into the ground, for passive energy reasons as well as to help it through planning.” Mawson explains that as the terrain “kicks up” slightly, he was able to tuck the building into the slight depression near the top of the slope, and follow the lateral curve of the site. 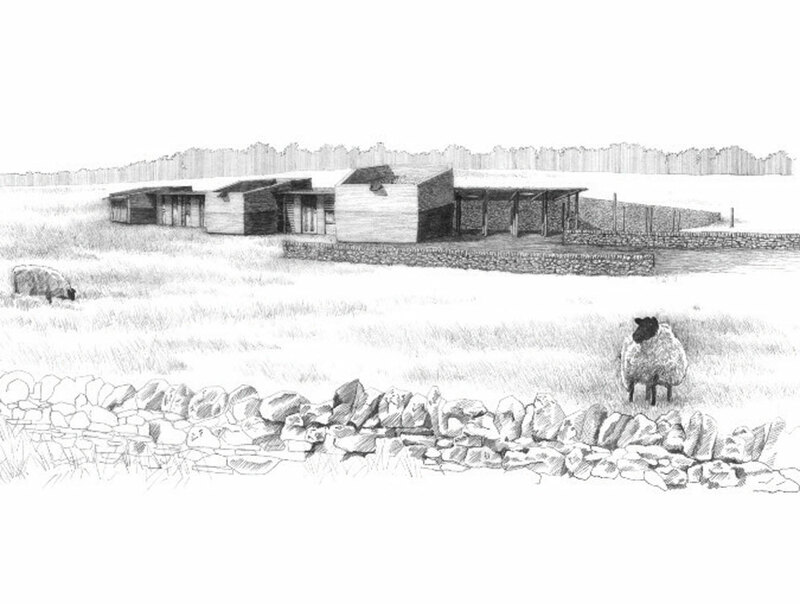 As a result the building, already a low single-storey structure, hunkers down and becomes part of the landscape. Its north elevation is buried into the hill so that only the slate wall is visible from the grass and wild-flower covered field above, plus the tops of three hexagonal lozenge-shaped ‘pods.’ Two smaller pods house therapy and meeting space, and a third larger structure functions as a workshop and performance hall. 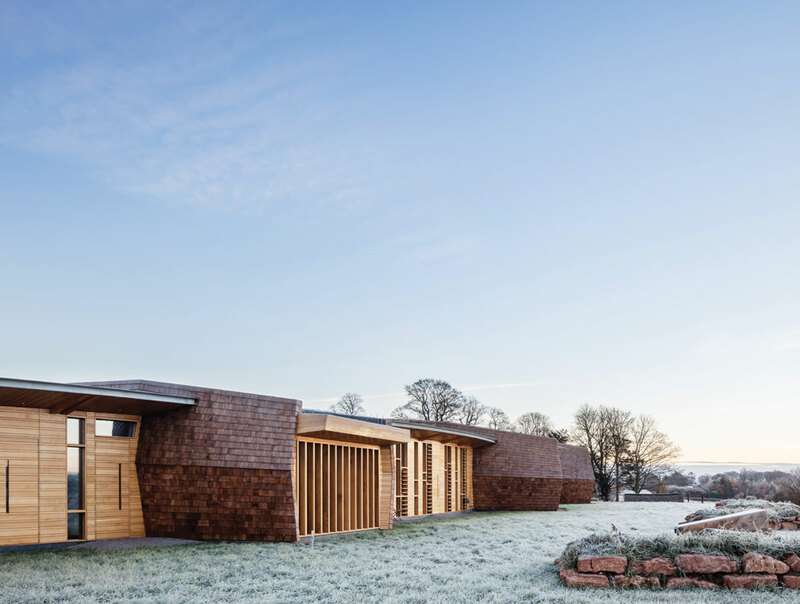 A curved overall volume containing circulation is clad with a wall of local Cumbrian slate to the north (facing the road) and glazing and timber cladding to the south. The north elevation is broken up by the protruding central section, and the three pods – there is a recurring musical theme in the design of the building’s form, and the pods’ placement at regular intervals in the composition is one example – alluding to notes on a score. 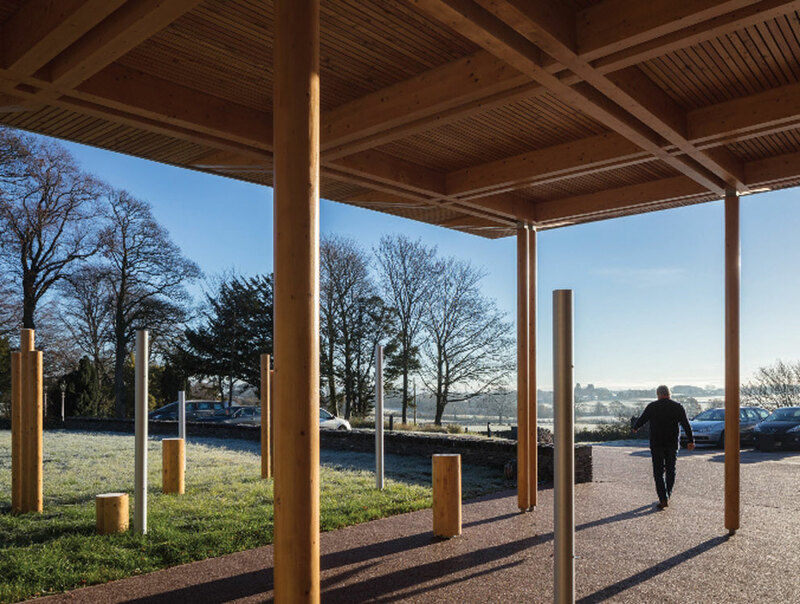 The language of cylindrical, milled glulam columns holding up the entrance canopy is continued in further columns in the adjacent therapy garden, “like music drifting into the landscape”, says Mawson. Similarly sized metal counterparts produce different notes when hit with a beater, which will resonate together. He notes that while creating a curved circulation has aesthetic benefits for all users, including dementia sufferers who find it less disorientating than a straight corridor, it had design challenges. 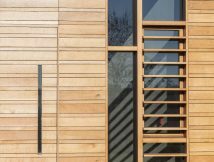 “When we got into the detailing it threw up a raft of junctions in the timber frame that we had to think about, but we were keen to have that sinuous element, with the pods inserted quite forcefully into it”. The entrance is located at the eastern end, with the 4 metre high canopy welcoming visitors, as well as a large green wall next to the front door in the draught lobby. Planted with scented species such as jasmine and lavender, this “awakens the senses” says Mawson, and will help dementia sufferers who benefit from strong, memorable triggers such as smell. 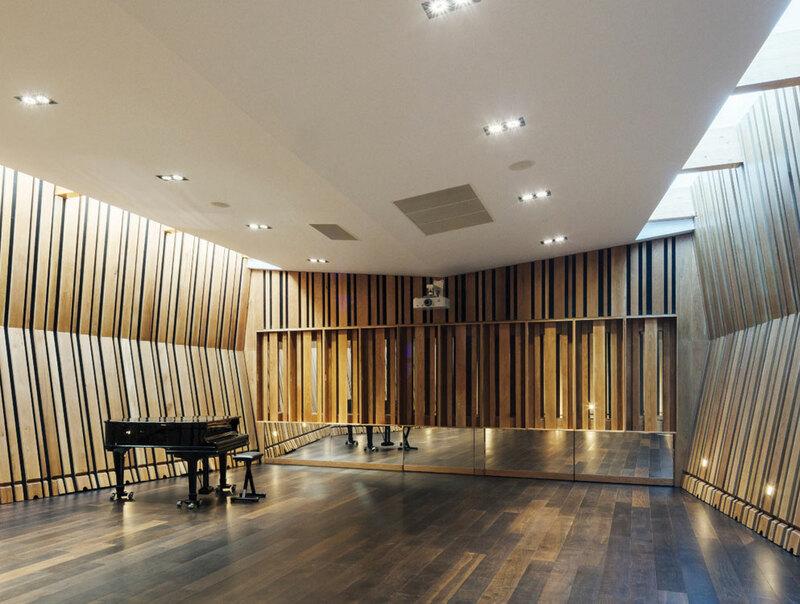 The generous reception space – used for public fundraising events, sits between the larger pod (officially dubbed Glassical Hall after the charity’s patron, composer Philip Glass), and the music therapy pod. The space is enlivened further by a sculpted plywood desk and a ceiling spanned by an 18 metre bow-string steel truss running through a double glulam beam. With a slight hint of a giant musical instrument, this truss also bisects a circular rooflight above the desk, and was a satisfying alternative to having to thicken up the beams to span the space. “It’s also a celebration of structure,” says Mawson, adding, “I always think it’s really important to understand the structure of a building when you’re in it.” The desk’s glass top is etched with the soundwave that is produced by a harp. The music therapy pod has two suites for performance or gentle sensory stimulation, either side of an acoustically-insulated recording studio, which is also hired out to generate additional income for the charity. The third pod houses a meeting space. The pods have skylights rather than windows to both increase the feeling of comfort for users, but also to avoid the acoustic problems which volumes of glass on walls can create. Their elongated hexagonal shape was partly derived from the advice of acoustic consultant Dr Douglas Doherty to avoid parallel surfaces in order to ameloriate acoustic reverberation. The main performance hall has also been carefully designed for optimum acoustics. 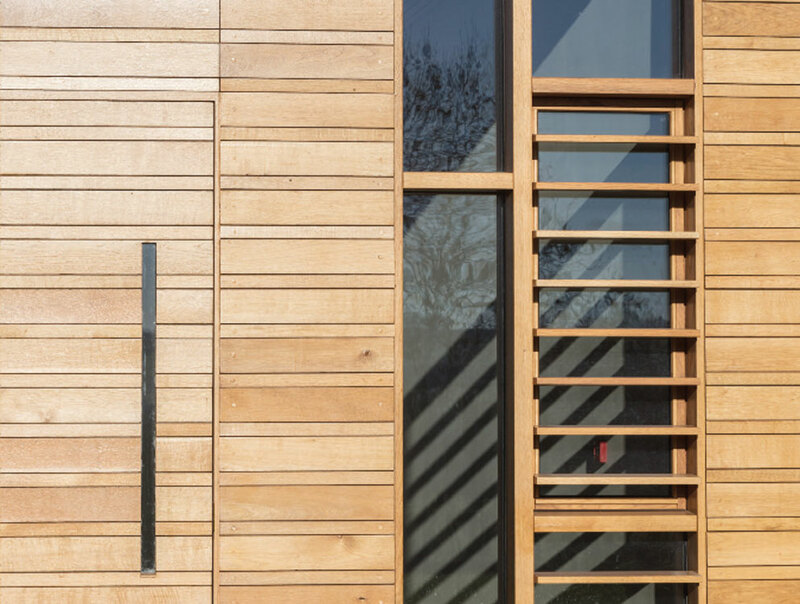 Behind the oak boards, whose width and spacing varies to break up sound waves, there is a ply, acoustic insulation and plasterboard backing build up, and the ceiling is an acoustic raft to deflect sound. The “quite introverted, almost womb-like” feel of the pods also helps the autistic service users with concentration, says Mawson: “We learned from the charity that autistic children and children with certain other disabilities didn’t need distraction, it could become very problematic. 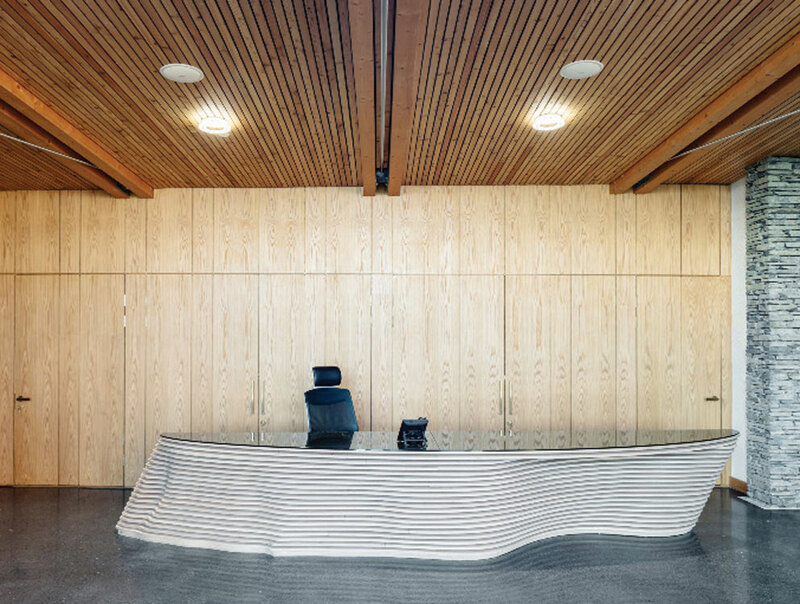 If you had an amazing view, people are going to run to that.” Users with visual impairments have been carefully considered – for example the timber floors have been dark stained (dark pigmented in the case of the polished concrete in circulation and reception areas) to provide contrast with the walls. The budget for a building of such high quality was relatively modest at £2m, however it all had to come from fund raising. Driven by Annie Mawson, this included concerts, one-off donations and sponsored bike and hill walks, and is just one reason of many to celebrate this project, whose contribution to the community has recently been recognised by numerous awards including one from RICS North West for Community Impact. 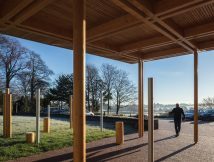 Although the client and architect “didn’t want a huge, look at me statement building”, says Will Mawson, at the same time “it was important for the charity that they had something which was an advert for what they do and showed they mean business,” with charities facing increasingly tough competition. This building does that in spades, however it is also a standout example of design for a very specific use which maintains the utmost respect for its location. This double-whammy could paradoxically make it something of a discreet icon in its field.